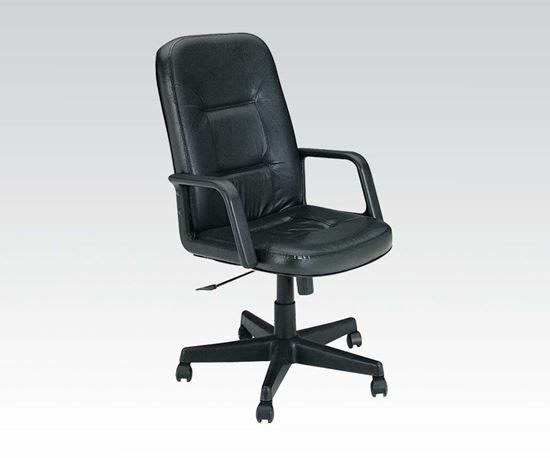 Luxurious and extremely comfortable, this Andrew Black Genuine Leather Office Chair is sure to a bold statement in your office. The immaculate chair has highly padded seat and high back upholstered with elegant genuine leather and a matching sleek black finish frame. Allows quick and easy adjustment regulates height of chair relative to floor. Chair rotates a full 360 degrees in either direction for ease of motion. It's is equipped with pneumatic height adjustment, star base with casters for easy mobility. The loop arms are designed to provide added support and comfort.